Logansport, IN - Building Products Development (BPD), a member company of LSI Metal Building Components Group Inc., announces that it is now offering metal-to-wood and metal-to-metal fasteners. • Lengths from 3/8" to 8"
• Drilling capabilities up to 0.500"
All fasteners come with 1,000-hour salt spray coating, and the company offers technical data that describes pullout values. 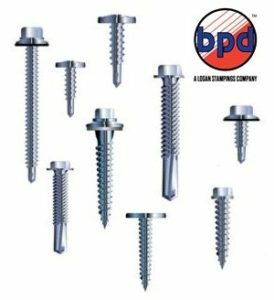 building-products-development-logoBPD offers metal roof clips, fasteners and related products. For more information, visit www.bpdusa.com.